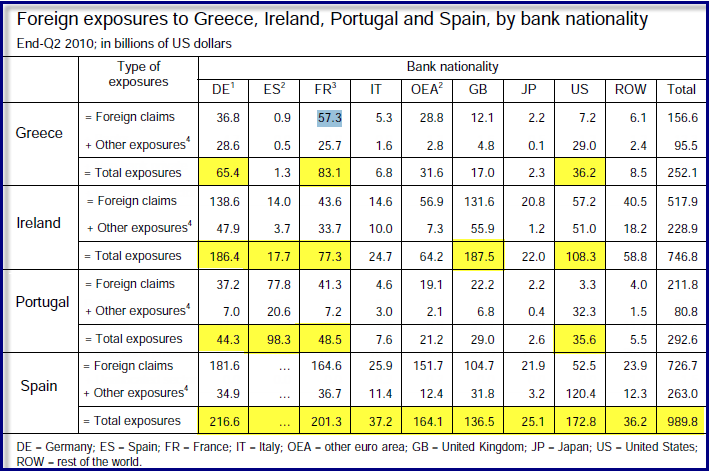 To explain the ECB's panic over Spain, all one needs to do is look at this "exposure table" from the recently published BIS Quarterly Review. I highlighted areas of interest. 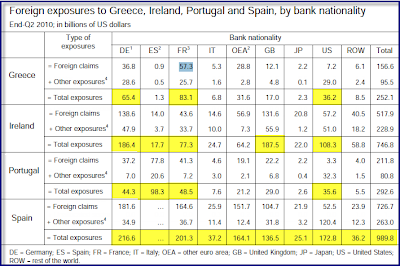 Note that Spain which itself needs to be bailed out, has a $98.3 billion exposure to Portugal (which will probably need to be bailed out next), as well as a $17.7 billion exposure to Ireland (bailout underway). Spain and Ireland are the big boys here, but the whole thing is a mess. The table does explain the panic at the ECB and EU to contain this mess. However, it is simply too late. The only question is how long will it take before this blows sky high? S&P lowered Belgium's outlook to "negative" from "stable", because ongoing political instability is hampering efforts to bring the country's deficit under control. Unless the situation is resolved, S&P is likely to cut its rating on Belgium's long-term debt by one notch by June 2011. Belgium has been without a government since April when its ruling coalition collapsed. A general election was held two months later, but Belgium's political parties are still trying to form a government. The country has struggled over the past few months to reach agreements on fiscal policy, social security, health care and labour market regulation. Belgium is currently running a total debt-to-GDP level of about 100%, and its annual deficit is likely to hit around 4.8% of GDP this year. The financial markets have been fretting about Belgium's ability to cut its deficit for several weeks. In late November the cost of insuring its debt against default hit a record high. While singing a song and dance about the strength of Spain that nobody in their right mind believes, simultaneously Moody’s puts Spain’s Debt Rating on Review. Moody’s Investors Service put Spain’s Aa1 debt rating on review for a possible downgrade on concern over the country’s funding needs, debt level and control over public finances. “Moody’s believes that the above-mentioned downside risks warrant putting Spain’s rating under review for downgrade,” Kathrin Muehlbronner, an analyst at Moody’s, said in the report. How's that for a wishy-washy statement probably intended to calm nerves but likely had the opposite effect. Spanish Prime Minister Jose Luis Rodriguez Zapatero will ask the European Union to be more flexible with the use of the region’s bailout fund, ABC reported without citing anyone. Zapatero will request that the fund be used spontaneously to give lines of credit to member countries which are experiencing a lack of liquidity due to the excessive lack of confidence shown by markets, the newspaper said. The IMF wants the EU to increase the size of the bailout fund, as if it would matter. It wouldn't. The situation is hopeless unless and until the ECB and EU agree to do the one thing that needs to be done - take haircuts on senior debt. On one side is the European Central Bank, which is spending billions to prop up Europe’s weak-kneed bond markets and safeguard the common currency. On the other side are hedge funds and big financial institutions that are betting against those same bonds and, by extension, against the central bank, that mighty symbol of Europe’s monetary union. The strains grew Tuesday, when European finance ministers made no pledge to increase the emergency fund that the European Union has put in place to help protect the euro. The head of the International Monetary Fund, meantime, urged Europe to take broader action to fend off speculators. “The game now is one now of cat and mouse,” said Mohamed A. El-Erian, chief executive of the bond giant Pimco. Already, the central bank owns about 17 percent of the combined debt of Greece, Ireland and Portugal, Goldman Sachs estimates. Yet in the bank’s mano a mano with the bond market, psychology could be more important than money. No single hedge fund, after all, can hope to outgun the central bank. What's the ECB going to do? Buy it all? Then what? Inquiring minds are reading Taking A Bite Out Of Bondholders by Tracy Alloway at Index Universe. “The great tragedy of the 2008/9 banking debacle was, despite the presence of more than sufficient capital, that the taxpayer was placed involuntarily into the capital structure, between bondholders and equity holders, to shield the bondholders from losses that they should have suffered,” said Paul Marson, of Lombard Odier private banking. What regulators and governments are now seeking to do is to take the public element out of financial crises and make sure that big financial losses take a fair chunk out of private investors – and specifically bondholders. Burden-sharing, as it’s now known now, would entail forcing debt investors to take haircuts on their investment, while bail-ins would enable regulators to compulsorily convert bonds into shares. To understand the shift taking place, it helps to imagine banks’ current capital order as something like a cake. Shareholders sit at the bottom and are most likely to take losses in a crisis. Junior debt investors sit in the middle, while senior debt investors occupy top position. Senior investors have traditionally been the last to bear losses should the bank fail, usually ranking equal with depositors under law. Marson estimates that, as of June 2010, Europe’s financial system had some US$13.8 trillion worth of bonds and just US$2 trillion worth of equity. Shifting losses onto the debt, rather than just the equity portion of banks’ capital structure would therefore provide a significant cushion should a bank fail. Part of Ireland’s bailout entails the creation of a European Stability Mechanism, at the behest of German Chancellor Angela Merkel. This would allow European governments to force haircuts or change the terms on bonds after 2013. Burden-sharing aside – momentum for bail-ins seems to be gaining pace. In an August consultation paper, the Basel Committee on Banking Supervision outlined the idea of requiring bank debt to be written-off and converted into equity before any government-sponsored bailout could take place.“A write-off can be viewed as a transfer of wealth from the [debt] instrument holder to the common shareholders,” the committee wrote, which suggests a whole new world for bank credit, and for the indices which track the sector. Specifically, bond investors will suddenly be exposed to plenty of downside risk in a crisis, while shareholders might suddenly find an added layer of protection. The new bank capital structure cake is looking decidedly of the ‘upside down’ variety. German Chancellor Angela Merkel pushed for a compromise that would allow haircuts for debt issued after 2013. She is correct in the need for haircuts, but the idea this mess can be delayed until 2013 is clearly flawed. Even if by some miracle things could be contained until 2013, who would buy any troubled debt going forward? And who would not scramble to buy debt of the doggiest countries now if the ECB was silly enough to guarantee it? Merkel abandoned the idea after ECB president Jean-Claude Trichet warned her not to "unsettle bondholders". For a look at Jean-Claude Juncker's plan to spread the pain by floating European-Wide E-Bonds, a plan trashed by both Germany and France, please see France Joins Germany to Nix Junker's Junk Bond Proposal to Save the Euro. With plans proposed and scrapped left and right, eventually the market will take matters into its own hands. The signal will be a sudden, steep, widening of credit spreads in Ireland, Portugal, and Spain. Given that the current EU plan is best describes as "hoping the problem goes away", I suspect that will happen sooner rather than later. The European Central Bank won't bail out debt-stricken member states such as Greece, which must repair its public finances on its own, ECB governing council member Ewald Nowotny said. "One has to be very clear: The ECB has no mandate or intention to take into account the situation of a specific country, especially not with regard to public finances," he said in an interview late Friday. Please keep statements like that in mind when you hear foolish talk from Trichet and Noyer that there will not be haircuts on senior bonds. Here is the precise quote to bookmark: "As far as I'm concerned, I exclude that there will be haircuts in the future" said Christian Noyer governor of the Bank of France. If you haven't noticed, I am getting a little fed up with EU planning, central planning in general. All I see is large amounts of money being passed around with interest, interest, and more interest which cannot possibly be paid back. I don't see anything sensible being arranged, just the usual unrealistic power grabs that are an insult to everyone. I don't think this will go down well overall. At some point people will turn and tell those trying to impose their will, to go home. 10-year Spanish bonds are at 5.6% this morning and the stock market is down nearly 2%. Eyes are the 10-year auction tomorrow. The EU has pulled every trick out of its hat for now, the only thing left is more ECB bond purchases which are strained already. The time for stumbling through the euro crisis is over. Piecemeal approaches and wait-and-see attitudes are endangering European integration. We now need a more radical, targeted effort to end the current uncertainty, and provide stronger support for the future of Europe’s common institutions. This must also protect the European Central Bank from becoming Europe’s “bad bank”, and ensuring its credibility and independence in guarding a strong euro. The required solution is a combination of a haircut for debt holders, debt guarantees for stable countries and the limited introduction of European-wide bonds in the medium term, accompanied by more aligned fiscal policies. These measures would only work together; none alone would restore stability. For example, we need a haircut for holders of Greek, Irish, and Portuguese debt. But we also must ensure that solvent member states, such as Spain and Italy, are not drawn into the downward spiral of financial speculation. We therefore must simultaneously guarantee the entire outstanding eurozone debt of stable countries, backed by an enhanced rescue fund. Here, eurobonds would send the message that Europe is strong, united and willing to deal jointly with whatever ­critical market situation emerges. But these bonds should only be launched with co-ordinated fiscal policies ensuring common minimum standards. How would these three measures work? First, Greece, Ireland and Portugal urgently need to be released from a substantial part of their debt. Painful spending cuts and structural reforms alone – of an extent unheard of in modern economic history – will not allow them to escape their debt trap. In the interest of all of Europe, we need to restructure their debt. Frank-Walter Steinmeier and Peer Steinbrück were respectively German foreign minister and German minister of finance between 2005 and 2009. There are many more details in the article regarding what the plan entails. Inquiring minds will give the article a closer look. Whether or not the plan would work is debatable. However, bickering while doing nothing cannot possibly work. Nor can any proposed solution that does not include significant haircuts on senior bonds. Unfortunately Chancellor Angela Merkel backed off her proposal to impose haircuts, and Germany and France both oppose E-Bonds. Of course Trichet and Noyer both insist "no haircuts"
Arguably, Steinmeier and Steinbrück have taken the best parts of three failed plans and combined them into one package. Will anyone go for it? Assuming they do, please go back to that table at the top, noting the banks exposed to the PIGS. Assuming they don't please do the same thing. One way or another, sooner or later, banks with PIGS exposure will take a hit. It may (or may not) be somewhat-orderly if the EU agrees on and carries out the Steinmeier-Steinbrück plan in a timely manner. It is 100% guaranteed to be disorderly, if the market gets tired or waiting and imposes its own solution.